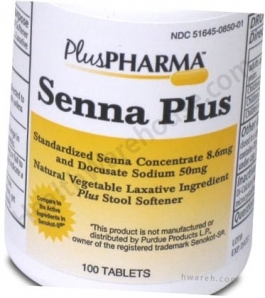 - Relieves occasional constipation (irregularity). - Generally produces a bowel movement in 6 -12 hours. Croscarmellose Sodium, D&C Yellow #10, Dicalcium Phosphate, FD&C Yellow #6, Hypromellose, Magnesium Stearate, Microcrystalline Cellulose, Polyethylene Glycol, Silica, Stearic Acid, Titanium Dioxide.